Birth: Born on 16th November in 1942 at Khonshahat village situated in between P.S. Bhushana. This is under the Madaripur Subdivision, Dist – Faridpur of earlier East Bengal. Education: He has done M.A. in Modern History from Calcutta University. He has taken Post Graduate Diploma in Librarianship and also done PhD in research of Folk songs & culture. Voluntary Service: he is the member of NIKHIL BHARAT BANGA SAHITYA SANMELAN. 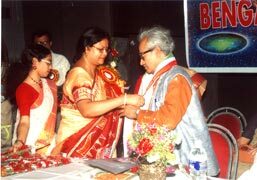 Dr chattopadhyay is now the Publication secratary,the treasurer of the state comittee and the Editor of Branch organ "Triparna". Bangiyo Sahityo Parishad : Ex assistant Secratary and the treasurer. Songs Makers Association: Working President. 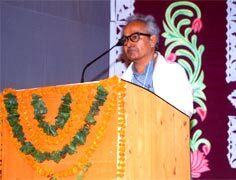 Ananda Abakash : General Secretary and editor of the magazine. Rupashree Palli Sanmelan:Founder General Secretary, and at present Vice President. Published Book: Folksongs of North Bengal: Bhaoaia O Chatka (Approved as Referance book in Post Graduate Syllabus of Calcutta University). Compiled Book : Subject Index to Calcutta Review. “Ponji” – the periodical Magazine of 20th Century (1 3rd part). Translation : Approved translator of National Book Trust.Already translated 12 books. Lyricist: Approved Lyricist, All India Radio, Television, CD Cassettes, Lysisist of many songs sung by different singers apart from “E Maser Gan” “Sharodia Pujar Gan” of All India Radio. Nibondho ‘Agomoni’ (Pages - 258), 2nd Part (Pages - 319), Mahabidroho O Lokgan Compiled by. Apart from it ‘Desh’, ‘Amrito’, ‘Paribartan’, ‘Nabokallol’, ‘Sammelani’, ‘Lokshruti’, ‘Bango Sammelani’, ‘Triparno’, ‘Padma - Ganga’. Published more than 200 essays, stories, poems, features, trend stories, plays etc. in different magazines till date. Nikhil Bharat Bango Sahityo Sammelan : 81st & 82nd Annual Conference. 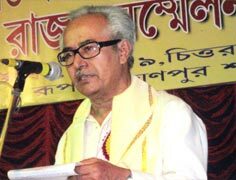 Apart from that, poet conference, Programme Bhasha sahid Dibas, New Year, Rabindra Janmotsab etc. 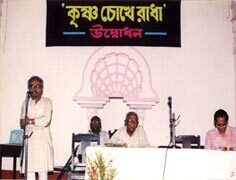 Bangio Granthagar Sammelan : Jalpaiguri, Howrah, Nadia, Krishnanagar etc. Saratchandra Smarak Samiti : Debanandapur, 2005. Director : ‘Srobori’, Prantyahiki, in All India Radio of Calcutta Branch Apart, in F,M also and in the programme ‘Aaj Rate’. Nikhil Bharat Bango Sahityo Sanmelan : The meeting on Folk literature and culture in 82nd Annual Conference. The programme on Folksong in CTVN Bengali Television Many Plays, feature and the programme on …….. and discussion on literature circulated in All India Radio. Ex. 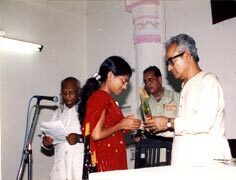 Professor: Sangeet Accademy of West Bengal. Ex. Professor and present examiner: Bangio Granthagar Parishad. Examiner: Artist Section of All India Radio. Examiner: PhD thesis of Kalyani University.